Can be activated using DxWnd. FSAA. Enhanced Graphics option must be turned off. See Downsampling for a workaround. Forced on. Can be forced off. 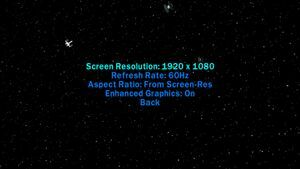 Maximum frame rate is tied to the game's refresh rate, can be changed manually below. 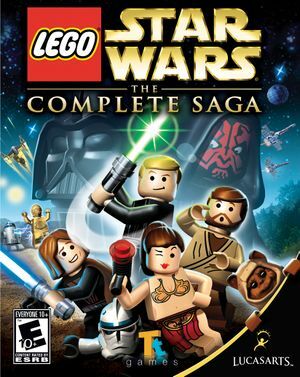 Open <path-to-game>\d3d9.ini or %USERPROFILE%\Documents\My Mods\SpecialK\Profiles\LEGOStarWarsSaga.exe\SpecialK.ini depending on the installation method you used. Change RefreshRate=-1 to the desired frame rate cap (e.g. RefreshRate=300). This value adjusts both the monitor's refresh rate and the game's maximum frame rate. High frame rates can reduce jump height. 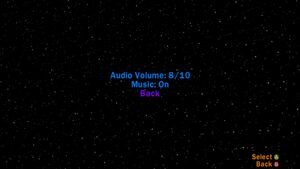 This is most obvious at the beginning of Episode VI, Chapter 3 "Speeder Showdown". It is impossible to jump over the fallen tree. Story Mode and Free Play support drop-in/drop-out co-op (Episode III Obi-wan vs Anakin fight is Versus). Only present in the Xbox 360 and PlayStation 3 versions. If the game crashes to a Blue Screen of Death randomly, usually within 5-10 minutes of play (e.g. 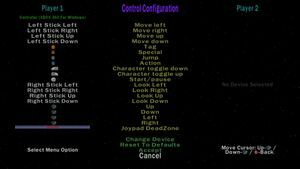 during cutscenes, in a level or the Cantina), disable internet connection prior to starting the game and keep it disabled until after quitting the game. See the beginners setup guide for instructions on how to configure the game for mod support. Setting up mods requires extracting the game's .DAT files, which noticeably increases file size. Adds 16 characters and 7 vehicles to the playable roster whom were originally in the game, but not playable. Not compatible with existing save files. ↑ 1.0 1.1 File/folder structure within this directory reflects the path(s) listed for Windows and/or Steam game data (use Wine regedit to access Windows registry paths). Games with Steam Cloud support may store data in ~/.steam/steam/userdata/<user-id>/32440/ in addition to or instead of this directory. The app ID (32440) may differ in some cases. Treat backslashes as forward slashes. See the glossary page for details.